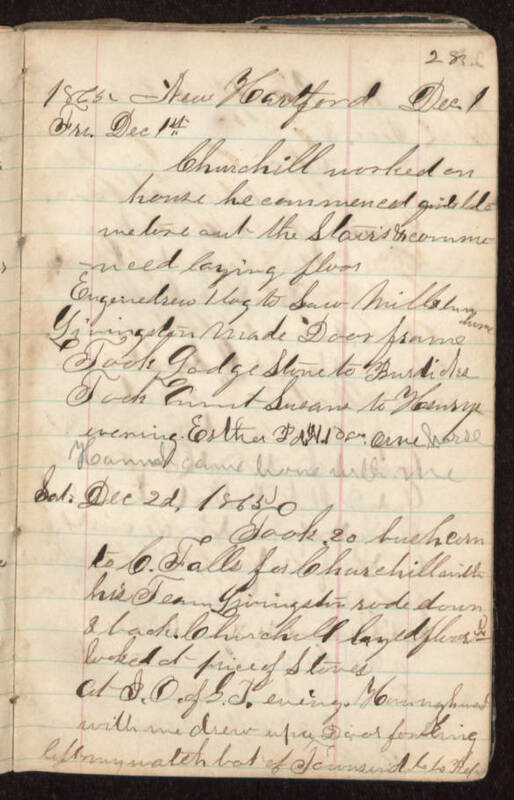 1865 - New Hartford - Dec. 1 Fri. Dec 1st Churchill worked on house he commenced quite late we tore out the Stairs & commenced laying floor. Eugene drew 1 log to Saw Mill & "[back? run?]" home. Livingston made Door frame. Took Lodge Stove to Burdicks. Took Aunt Susans to Henrys evening. Esther Pd. $10.00 "[Orne?]" horse. Hannah came home with me. Sat. Dec 2d, 1865 Took 20 bush. corn to C. Falls for Churchill with his Team. Livingston rode down & back. Churchill layed floor "[illegible]" looked at price of Stoves. at I. O. of G.T. eve'ing. "[H____gh]" with me drew "[illegible]" Door "[illegible]" left my watch. bot of Townsend "[illegible]" "[lbs?]" "[Ref.?]"